Our Abpromise guarantee covers the use of ab172324 in the following tested applications. Flow Cyt 1/1000 - 1/2000. ab171464 - Mouse monoclonal IgG2a (Alexa Fluor® 488), is suitable for use as an isotype control to complement this secondary antibody. Overlay histogram showing subclass specificity of ab172324. HeLa cells were fixed with 4% paraformaldehyde (10 min) and then permeabilized with 0.1% PBS-Tween for 20 min. The cells were then incubated in 1x PBS / 10% serum / 0.3M glycine to block non-specific protein-protein interactions followed by the primary antibody (1μg/1x106 cells) as indicated: ab8982 (Mouse IgG1), ab49105 (Mouse IgG2a), ab16965 (Mouse IgG2b), ab60602 (Mouse IgG3), ab55602 (Mouse IgM) for 30 min at 22°C. 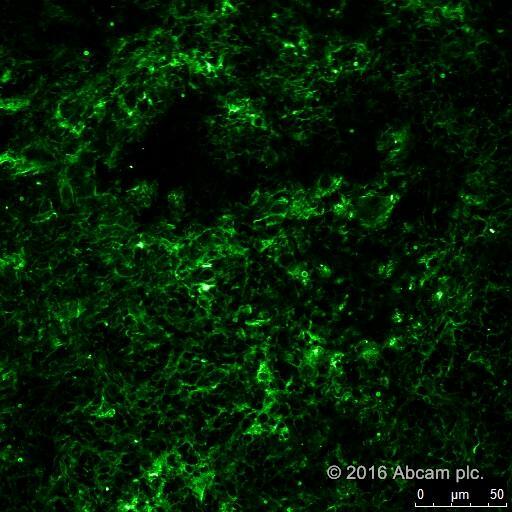 The secondary antibody (ab172324 - Rat monoclonal (SB84a) Anti-Mouse IgG2a, heavy chain - Alexa Fluor® 488) was used at 1/1000 dilution for 30 min at 22ºC. Unlabelled (blue line) and secondary only (gold line) samples were also used as negative controls. Acquisition of >5,000 events were collected using a 20mW Argon ion laser (488nm) and 525/30 bandpass filter. ab172324 has not yet been referenced specifically in any publications. Publishing research using ab172324? Please let us know so that we can cite the reference in this datasheet. 4. After washing, Tissue was stained with ab172324 - Rat monoclonal (SB84a) Anti-Mouse IgG2a heavy chain (Alexa Fluor® 488) for 2 hours in Blocking Buffer.